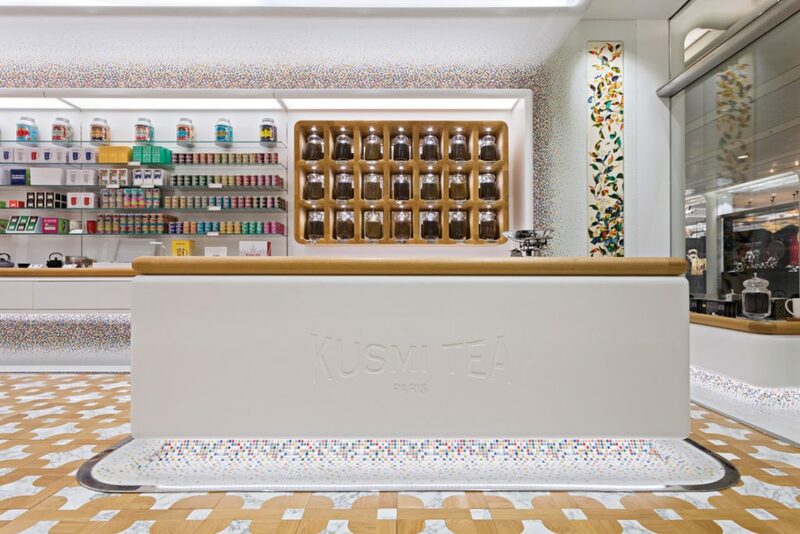 Kusmi Paris has been blending its famous teas since 1867. Initially based in Saint Petersburg, the brand moved to Paris in 1917. The brief to Christopher Jenner was to design a brand new concept that would balance Kusmi’s baroque Russian heritage with its French provenance, creating a new luxury positioning through narrative and ritual. Inspired by his travels to both Saint Petersburg and Paris, Jenner has taken his cue from French savoir faire and the exceptional craftsmanship of the Church of the Savior in Saint Petersburg, with its incredible mosaics, Orthodox brass chandeliers, marble flooring and onion domes. Kusmi’s own iconic packaging also created a starting point, leading to a special collaboration with Bisazza in which their matt white mosaic glass tiles have been used for the first time, set within an abstract pattern of primary and secondary colours. Two large stylised illustrations inspired by Camellia Senensis, a small shrub whose leaves and buds are used in tea making, are realised in marquetry using with more than 30 coloured veneers and mother-of-pearl paying tribute to the art of tea blending. A bespoke parquet floor in Italian marble and French Oak sits below a breath-taking three tiered, cnc Stainless Steel chandelier. Its 30 interlaced, organic arms connect to a central shaft of multiple turned components that disappear into a multi-coloured, stained-glass onion dome set within the ceiling, evoking the Russian heritage of the brand. The space reflects a meticulous commitment to craft and technology, where traditional techniques are amplified through computer added design. The new Flagship opened in January 2016 within the Calatrava station at the World Trade centre in New York. www.christopher-jenner.com | Photography courtesy of Michael Franke.